Technologies : Step 5/5 is complete! The last main step to complete a releasable version of Ymir is finally complete: technologies. Technologies work in 3 steps : Ideas, Projects, and Knowledges. When an idea appears, it unlock a Project. 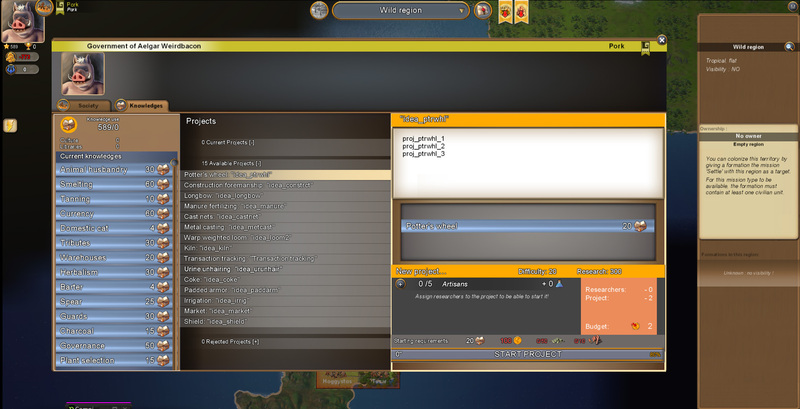 The project is visible to the player and all available projects are listed in his government menu. Projects are tasks that can costs money or resources and need researchers to be assigned to it. Once completed , a project gives the player a new Knowledge. Each project requires a specific population class as researchers : for instance an agricultural one will require Farmers. 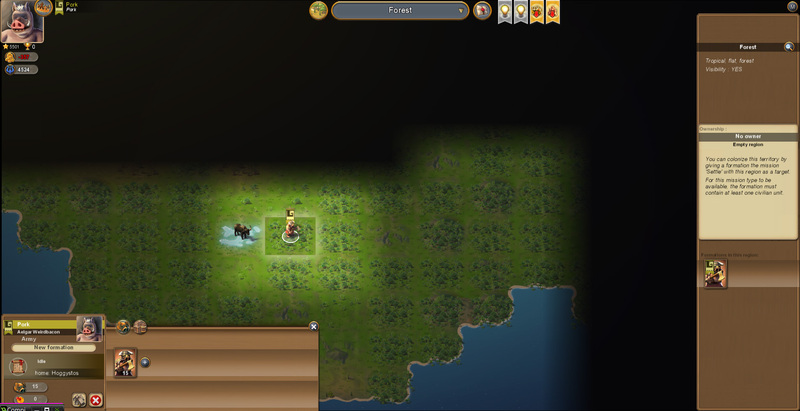 To start the project , the player has to assign a certain amount of this population class to the project, but it will reduce proportionally their productivity in their respective buildings ( If a project requires Farmers and half the available farmers are assigned to it, all Farms will have their workforce reduced by half ). Knowledges are the actual ‘techs’ : they unlock new buildings, new resources, new policies etc. Each knowledge however requires a certain amount of ‘knowledge storage’ points, depending on how complex it is. Knowledge points represent the capacity of your society to hold and remember all its techs and skills and it is increased by 2 things : your total culture (and therefore the amount of total population in your society ) and libraries ( once you develop some form of writting ). You cannot get new knowledges if you reached your current limit. The “knowledges” tab of the government menu, listing all the currently available projects and all the currently held knowledges on the left ( many texts for projects and techs are still missing, for there is a lot of them to write! ). I also added worldmap exploration (black tiles until you explore them a first time) and Exploration events. Exploration events are triggered each time you move and uncover new tiles in the worldmap. Its on a per-player basis so events will be triggered regardless of other players exploring the same tile previously. These events are here to make the early game more eventful , as your expeditions can discover useful loots and be joined by new units but also face many dangers. Once an area is explored it no longer triggers these events to move through it, making the path “safe”. It adds challenge and a feeling of ‘distance’ preventing players from easily discovering the whole world right from the start. I added new early-game defenses : simple walls ( palisades ) and new freestanding defensive ‘stone age’ tower. Those simple walls are breachable like doors, unlike the big “platform” walls that have to be climbed by the enemy. 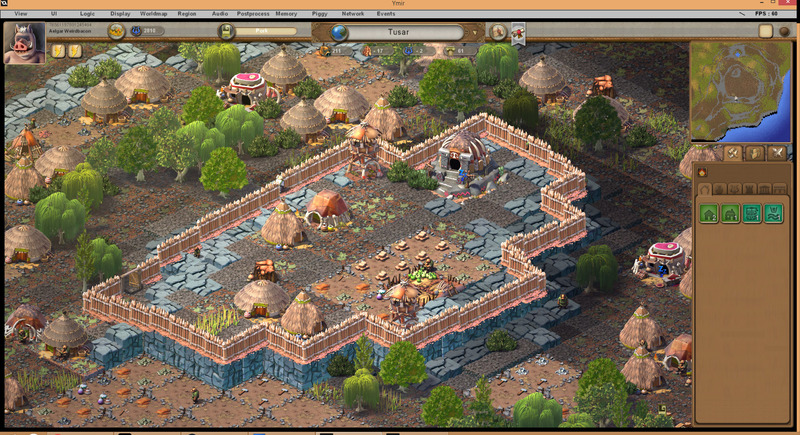 The wooden palisade is available right from the start and allows to quickly defend your early village and take advantage of natural positions as the big “platform” walls are only available much later in game. 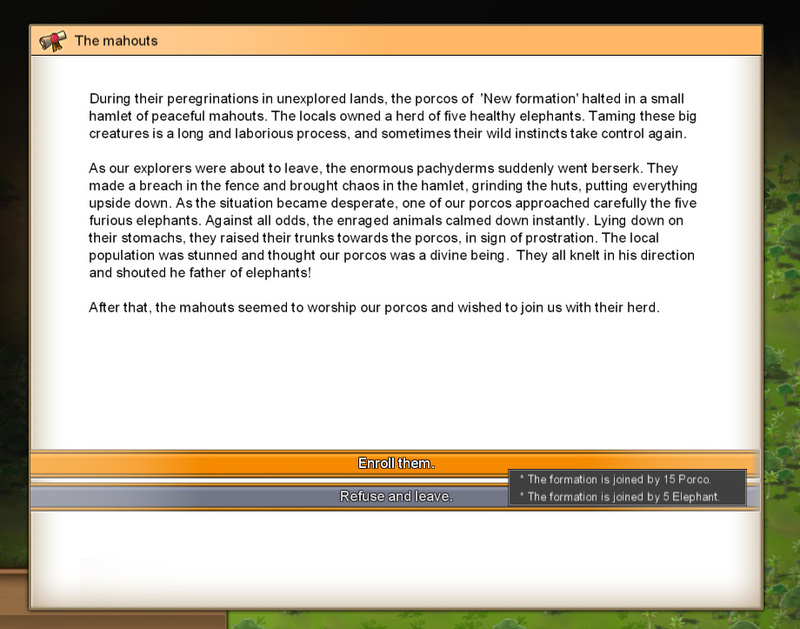 Also to make early game more eventful, I’ve added Herds and a new hunting action. Herds are groups of neutral animal units ( a formation belonging to the Gaia npc faction ) that can be attacked to ‘hunt’ them and will give you big loots of meat and leather to boost your early cities. Unlike a ‘resource spot’ of animals in a region that you can continuously exploit with a hunter building, herds are actual units – like an army – visible on the world map and with a finite amount of animals. They will give you a lot of food at once, but once killed the herd disappears. Sometimes herds will spawn from events near your villages in early game. Otherwise you’ll have to explore the worldmap to find new herds before other players, and, as explained up, exploring is now a risky thing. 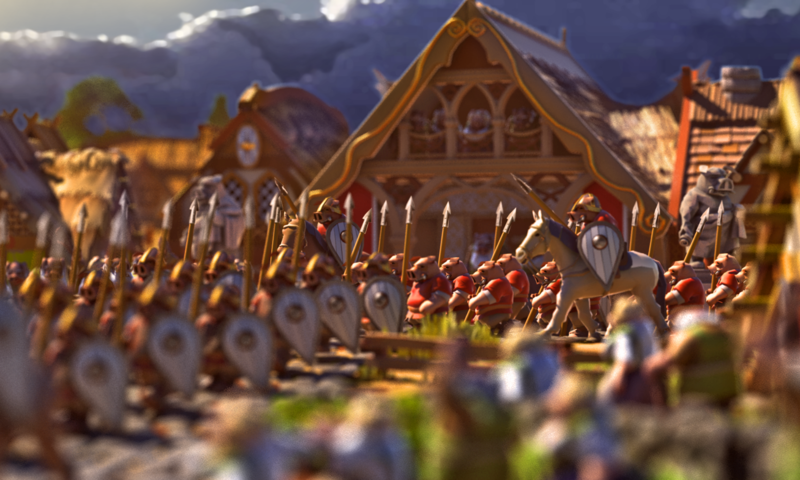 Hunting a herd actually triggers a ‘battle’ where your units try to kill all the animals, so depending on the animal’s stats it can be more or less dangerous. Once you mastered the knowledge of “animal capture”, it will also give you chances to capture some animals alive which you can then use as livestock and later on to start animal husbandry. The closed testing of Ymir before its release should begin soon. To participate you’re welcome to join the Ymir Discord where the announcement and organizing will be done when the time comes. Before that, i’m busy doing various misc tasks of ‘polishing’ the game : fixing various issues i kept postponing, bugs, improving some things etc. For instance i redesigned some UIs ( got rid of the top bar ) and replaced all the placeholder icons. I’m already testing the game with only a few friends and re-balancing / adding contents based on the feedback. Amongst these polishing tasks it now appeared necessary to include a more detailed tutorial. I also need to add more events including Victory Point missions : global missions that award victory points to the first player that completes it, so that the game can have a formal ending. Once all these misc tasks are completed, closed testing will begin distributing gradually an increasing number of temporary steam keys ( up to about 200 ) . After testing is complete, the game will then be formally released in ‘early access’. Steam store page is live. 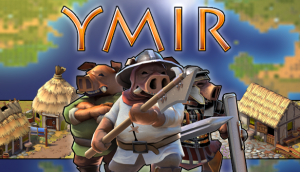 The store page of Ymir is now live on steam. You can now add it to your wishlist and make sure you don’t miss it’s release when the time comes !